Global temperature now exceeds +1.25 °C relative to 1880–1920, similar to warmth of the Eemian period. Keeping warming less than 1.5 °C or CO2 below 350 ppm now requires extraction of CO2 from the air. If rapid phaseout of fossil fuel emissions begins soon, most extraction can be via improved agricultural and forestry practices. 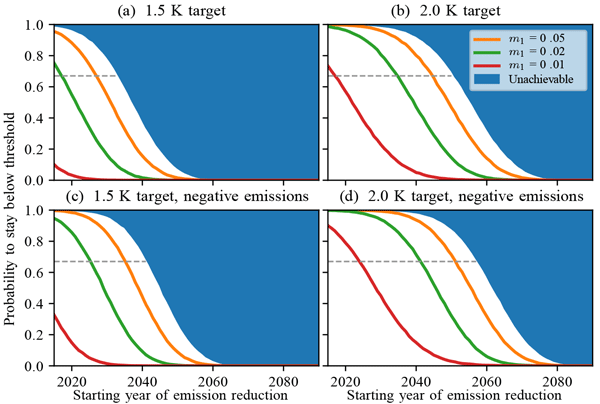 In contrast, continued high emissions places a burden on young people of massive technological CO2 extraction with large risks, high costs and uncertain feasibility. We present for the first time a comprehensive assessment of key climate impacts for the policy relevant warming levels of 1.5 °C and 2 °C above pre-industrial levels. We report substantial impact differences in intensity and frequency of extreme weather events, regional water availability and agricultural yields, sea-level rise and risk of coral reef loss. The increase in climate impacts is particularly pronounced in tropical and sub-tropical regions. We determine the point of no return (PNR) for climate change, which is the latest year to take action to reduce greenhouse gases to stay, with a certain probability, within thresholds set by the Paris Agreement. For a 67 % probability and a 2 K threshold, the PNR is the year 2035 when the share of renewable energy rises by 2 % per year. We show the impact on the PNR of the speed by which emissions are cut, the risk tolerance, climate uncertainties and the potential for negative emissions. Sea level will continue to rise for centuries. 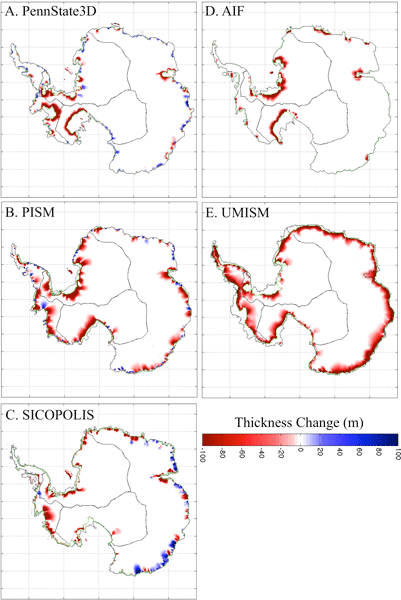 We investigate the option of delaying sea-level rise by pumping ocean water onto Antarctica. Due to wave propagation ice is discharged much faster back into the ocean than expected from pure advection. 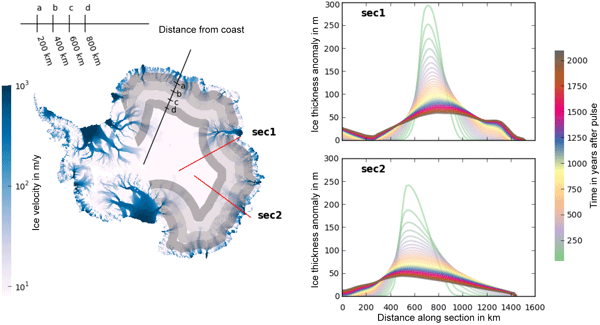 A millennium-scale storage of > 80 % of the additional ice requires a distance of > 700 km from the coastline. The pumping energy required to elevate ocean water to mitigate a sea-level rise of 3 mm yr−1 exceeds 7 % of current global primary energy supply. 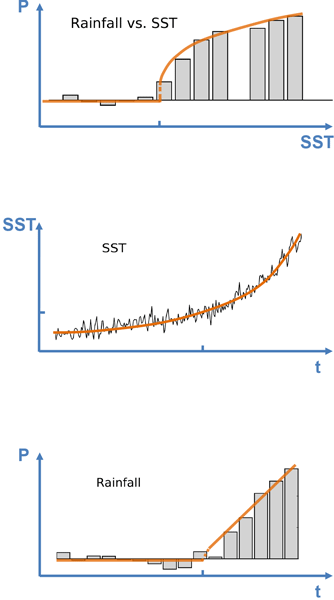 Climate sensitivity can be quantified using measured changes in temperature and forcings. This approach requires disentangling natural and anthropogenic influences on global climate. We focused on the role of the Atlantic Multidecadal Oscillation (AMO) in this and show how different AMO characterizations influence the anthropogenic temperature trends (we found they were in between previously published values) and transient climate sensitivity, which we found to be 1.6 (1.0-3.3)°C. Can bioenergy cropping compensate high carbon emissions from large-scale deforestation of high latitudes? Rapidly rising atmospheric CO2 concentrations caused by human actions over the past 250 years have raised cause for concern that changes in Earth’s climate system may progress at a much faster pace and larger extent than during the past 20,000 years. Questions that yet need to be answered are what the carbon uptake kinetics of the oceans will be in the future and how the increase in oceanic carbon inventory will affect its ecosystems. Major future ocean carbon research challenges are discussed. Monsoon systems have undergone abrupt changes in past climates, and theoretical considerations show that threshold behavior can follow from the internal dynamics of monsoons. So far, however, the possibility of abrupt changes has not been explored for modern monsoon systems. We analyze state-of-the-art climate model simulations and show that some models project abrupt changes in Sahel rainfall in response to a dynamic shift in the West African monsoon under 21st century climate change. We investigate the temporal characteristics of partitioned evaporation on land, and we present STEAM (Simple Terrestrial Evaporation to Atmosphere Model) -- a hydrological land-surface model developed to provide inputs to moisture tracking. The terrestrial residence timescale of transpiration (days to months) has larger inter-seasonal variation and is substantially longer than that of interception (hours). This can cause differences in moisture recycling, which is investigated more in Part 2. Climate over decadal timescales, forced by added greenhouse gases, could either change independently of internally generated variability or interact with it. For hypothesis 1, the atmosphere warms gradually, affected by random climate noise. For hypothesis 2, warming is nonlinear and step-like. Two statistical models, step and trend, are used to analyse observed and modelled temperatures; the results are subject to six tests. In conclusion, externally forced warming is step-like at these scales.